Spiders are air-breathing chelicerate arthropods that have two body segments, eight legs, and no chewing mouth parts. About 40,000 species have been identified. In spiders' bodies the usual arthropod segments are fused into two tagmata, the cephalothorax and abdomen, joined by a small, cylindrical pedicel. As in all arthropods the coelom is very small and the main body cavity is a hemocoel through which hemolymph delivers oxygen and nutrients to the tissues and removes waste products. The gut is so narrow that spiders cannot eat large lumps of solid matter, and spiders liquidize their food by flooding it with digestive enzymes and grinding it with the appendages around their mouths. In all except the most primitive group, the Mesothelae, spiders have the most centralized nervous systems of all arthropods, as all their ganglia are fused into one mass in the cephalothorax. Unlike most arthropods, spiders have no extensor muscles in their limbs and instead extend them by hydraulic pressure. Their abdomens bear appendages that have been modified into spinnerets that extrude silk from up to six types of silk gland within their abdomens. Spider silk provides a combination of lightness, strength and elasticity that is superior to that of synthetic materials, and spider silk genes have been inserted into mammals and plants to see if these can be used as silk factories. As a result of their wide range of behaviors, spiders have become common symbols in art and mythology, symbolizing various combinations of patience, cruelty and creative powers. A vegetarian species was described in 2007, but all others are predators, mostly preying on insects and on other spiders, although a few large species also take birds and lizards. However the young of many spiders supplement their diet with nectar and there is statistical evidence that adults supplement theirs with pollen. Spiders' chelicerae are modified into fangs, which in most cases can inject venom into prey. While the venom of a few species is dangerous to humans, scientists are now researching the use of spider venoms in medicine and as non-polluting pesticides. 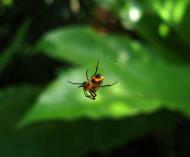 Spiders capture prey by trapping it in sticky webs, waiting in ambush for it or running it down. Species that use webs or ambush tactics are extremely sensitive to vibrations in the air, ground and silk threads that they use as tripwires, while the active hunters have eyesight up to ten times as acute as that of dragonflies. Some active hunters also use different tactics for different prey, and show signs of intelligence by trying a variety of tactics against difficult prey and by learning very quickly what tactics to adopt against unfamiliar prey. Others have modified bodies and behavior patterns that enable them to mimic ants on which they prey. 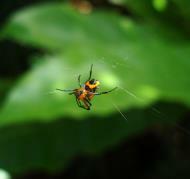 Spider's webs vary widely in size, shape and the amount of sticky thread used. It now appears that the spiral orb web may be one of the earliest forms. Orb-web spiders, although well-known and the most extensively studied, are a minority of spider species and spiders that produce other types of web are more abundant, possibly because their tangled webs present greater obstacles to predatory wasps. In males spiders the pedipalps (appendages just below / behind the mouth) are modified as syringes that inject sperm into females' genitalia. 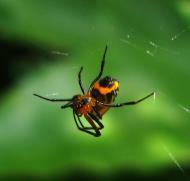 To avoid being eaten before they can mate, male spiders identify themselves by a variety of complex courtship rituals. Males of most species survive a few matings, limited mainly by their short life spans, and in a few species males live for a while in their mates' webs. However males of a few species impale themselves on the females' fangs while mating, perhaps because ensuring that their mates are well-fed increases the likely number of offspring. Female spiders weave silk egg-cases, each of which may contain hundreds of eggs; the spiders then hatch as apparently miniature adults, although most are incapable of feeding until after their first molt. Females of many species care for their young, for example by carrying them around or by sharing food with them. A minority of species are social, building communal webs that may house anywhere from a few to 50,000 individuals. Social behavior ranges from precarious toleration, as in the aggressive widow spiders, to co-operative hunting and food-sharing. Although most spiders live for at most two years, tarantulas and other mygalomorph spiders can live up to 25 years in captivity. Spider-like arachnids with silk-producing spigots appear in the Devonian period about 386 million years ago, but these animals apparently lacked spinnerets. True spiders have been found in Carboniferous rocks from 318 to 299 million years ago, and are very similar to the most primitive surviving order, the Mesothelae. The main groups of modern spiders, Mygalomorphae and Araneomorphae, first appear in the Triassic period, before 200 million years ago. After 130 million years ago fossil amber preserves details of spiders' anatomy and behavior, including mating, killing prey, producing silk and possibly caring for their young. 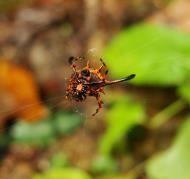 In a few cases amber has preserved spiders' egg sacs and webs, occasionally with prey attached. Spiders are chelicerates and therefore arthropods. As arthropods they have: segmented bodies with jointed limbs, all covered in a cuticle made of chitin and proteins; heads that are composed of several segments that fuse during the development of the embryo. Being chelicerates, their bodies consist of two tagmata, sets of segments that serve similar functions: the foremost one, called the cephalothorax or prosoma, is a complete fusion of the segments that in an insect would form two separate tagmata, the head and thorax; the rear tagma is called the abdomen or opisthosoma. 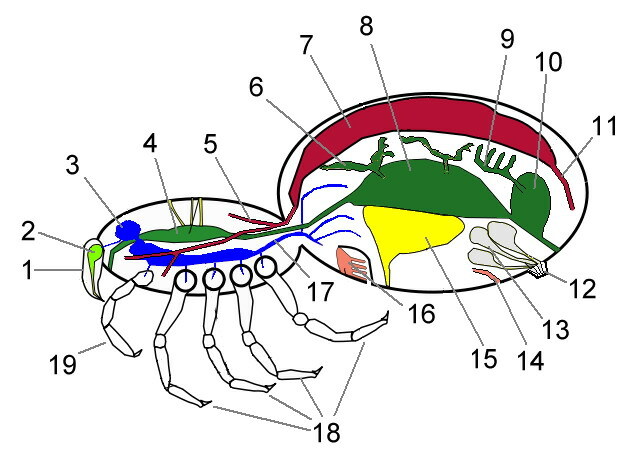 The pattern of segment fusion that forms chelicerates' heads is unique among arthropods, and what would normally be the first head segment disappears at an early stage of development, so that chelicerates lack the antennae typical of most arthropods. In fact chelicerates' only appendages ahead of the mouth are a pair of chelicerae, and they lack anything that would function directly as "jaws". The first appendages behind the mouth are called pedipalps, and serve different functions within different groups of chelicerates. Spiders and scorpions are members of one chelicerate group, the arachnids. While scorpions' chelicerae are generally a modest pair of claws that they use in feeding, spiders' terminate in fangs that are are generally venomous, and fold away behind the upper sections while not in use, while the upper sections generally have thick "beards" that filter solid lumps out of their food, as spiders can take only liquid food; On the other hand scorpions' pedipalps generally form large claws for capturing prey, while those of spiders are fairly small sensors whose bases also act as an extension of the mouth; in addition those of male spiders have enlarged last sections used for sperm transfer. Like other arthropods, spiders are coelomates in which the coelom is reduced to small areas round the reproductive and excretory systems. Its place is largely taken by a hemocoel, a cavity that runs most of the length of the body and through which blood flows. The heart is a tube in the upper part of the body, with a few ostia that act as non-return valves allowing blood to enter the heart from the hemocoel but prevent it from leaving before it reaches the front end, However in spiders it occupies only the upper part of the abdomen, and blood is discharged into the hemocoel by one artery that opens at the rear end of the abdomen and by branching arteries that pass through the pedicle and open into several parts of the cephalothorax. Hence spiders have open circulatory systems. The blood of many spiders that have book lungs contains the respiratory pigment hemocyanin to make oxygen transport more efficient. The basic arthropod central nervous system consists of: a pair of nerve cords running below the gut, with paired ganglia as local control centers in all segments; a brain formed by fusion of the ganglia for the head segments ahead of and behind the mouth, so that the esophagus is encircled by this conglomeration of ganglia. Except for the primitive Mesothelae, of which the Liphistiidae are the sole surviving family, spiders have the much more centralized nervous system that is typical of archnids: all the ganglia of all segments behind the esophagus are fused, so that the cephalothorax is largely filled with nervous tissue and there are no ganglia in the abdomen; in the Mesothelae, the ganglia of the abdomen and the rear part of the cephalothorax remain unfused. Most spiders have four pairs of eyes on the top-front area of the cephalothorax, arranged in patterns that vary from one family to another. The pair at the front are of the type called pigment-cup ocelli ("little eyes"), which in most arthropods are only capable of detecting the direction from which light is coming, using the shadow cast by the walls of the cup. However the main eyes at the front of spiders' heads are pigment-cup ocelli that are capable of forming images. The other eyes are thought to be derived from the compound eyes of the ancestral chelicerates, but no longer have the separate facets typical of compound eyes. Unlike the main eyes, in many spiders these secondary eyes detect light reflected from a reflective tapetum, and wolf spiders can be spotted by torch light reflected from the tapeta. On the other hand jumping spiders' secondary eyes have no tapeta. Jumping spiders' visual acuity exceeds by a factor of ten that of dragonflies, which have by far the best vision among insects; in fact the human eye is only about five times sharper than a jumping spider's. They achieve this by a telephoto-like series of lenses, a four-layer retina and the ability to swivel their eyes and integrate images from different stages in the scan. The downside is that the scanning and integrating processes are relatively slow. As with other arthropods, spider's cuticles would block out information about the outside world, except that they are penetrated by many sensors or connections from sensors to the nervous system. In fact spiders and other arthropods have modified their cuticles into elaborate arrays of sensors. Various touch sensors, mostly bristles called setae, respond to different levels of force, from strong contact to very weak air currents. Chemical sensors provide equivalents of taste and smell, often by means of setae. Spider also have in the joints of their limbs slit sensors that detect vibration. In web-building spiders all these mechanical and chemical sensors are more important than the eyes, while the eyes are most important to spiders that hunt actively. Although all arthropods use muscles attached to the inside of the exoskeleton to flex their limbs, spiders and a few other groups still use hydraulic pressure to extend them, a system inherited from their pre-arthropod ancestors. As a result a spider with a punctured cephalothorax cannot extend its legs, and the legs of dead spiders curl up. Spiders can generate pressures up to eight times their resting level in order to extend their legs, and jumping spiders can jump up to 50 times their own length by suddenly increasing the blood pressure in the third or fourth pair of legs. Like other arthropods, spiders have to molt in order to grow as their cuticles ("skins") cannot stretch. In some species males mate with newly-molted females, which are too weak to be dangerous to the males. Most spiders live for only one to two years, although some tarantulas have lived in captivity for up to 25 years. Spiders occur in a large range of sizes. The smallest, dwarf spiders of the subfamily Erigoninae, are less than 1 mm (about .05 inches) in body length. The largest and heaviest spiders occur among tarantulas, which can have body lengths up to 90 mm (about 3.5 inches) and leg spans up to 250 mm (about 10 inches). Only three classes of pigment (ommochromes, bilins and guanine) have been identified in spiders, although other pigments have been detected but not yet characterized. Melanins, carotenoids and pterins, very common in other animals, are apparently absent. In some species the exocuticle of the legs and prosoma is modified by a tanning process, resulting in brown coloration. Bilins are found for example in Micrommata virescens, resulting in its green color. 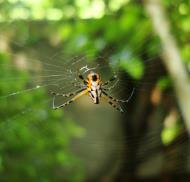 Guanine is responsible for the white markings of the European garden spider Araneus diadematus. It is in many species accumulated in specialized cells called guanocytes. In genera such as Tetragnatha, Leucauge, Argyrodes or Theridiosoma, guanine creates their silvery appearance. While guanine is originally an end-product of protein metabolism, its excretion can be blocked in spiders, leading to an increase in its storage. Structural colors occur in some species, which are the result of the diffraction, scattering or interference of light, for example by modified setae or scales. The white prosoma of Argiope results from hairs reflecting the light, Lycosa and Josa both have areas of modified cuticle that act as light reflectors. 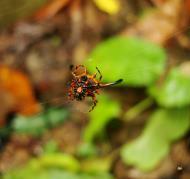 Various species are known to feed on dead arthropods (scavenging), web silk, and their own shed exoskeletons. Pollen caught in webs may also be eaten, and studies have shown that young spiders have a better chance of survival if they have the opportunity to eat pollen. In captivity, several spider species are also known to feed on bananas, marmalade, milk, egg yolk and sausages. In one praying mantis species, juveniles also actively feed on pollen and adults that capture pollen-laden insects eat the pollen as well. Net-casting spiders weave only small webs but then manipulate them to trap prey. Those of the genus Hyptiotes and the family Theridiosomatidae stretch their webs and then release them when prey strike them, but do not actively move their webs. Those of the family Deinopidae weave even smaller webs, hold them outstretched between their first two pairs of legs, and lunge and push the webs as much as twice their own body length to trap prey, and this move may increase the webs' area by a factor of up to ten. Experiments have shown that Deinopis spinosus has two different techniques for trapping prey: backwards strikes to catch flying insects, whose vibrations it detects; and forward strikes to catch ground-walking prey that it sees. These two techniques have also been observed in other deinopids. Walking insects form most of the prey of most deinopids, but one population of Deinopis subrufus appears to live mainly on tipulid flies that they catch with the backwards strike. Trapdoor spider (family: Ctenizidae), an ambush predator. Some jumping spiders of the genus Portia hunt other spiders in ways that seem intelligent, outflanking their victims or luring them from their webs. Laboratory studies show that Portia's instinctive tactics are only starting points for a trial-and-error approach from which these spiders learn very quickly how to overcome new prey species. However they seem to be relatively slow "thinkers", which is not surprising as their brains are vastly smaller than those of mammalian predators. Ant-mimicking spiders face several challenges: they generally develop slimmer abdomens and false "waists" in the cephalothorax to mimic the three distinct regions (tagmata) of an ant's body; they wave the first pair of legs in form to their heads to mimic antennae, which spiders lack, and to conceal the fact that they have eight legs rather than six; they develop large color patches round one pair of eyes to disguise the fact that they generally have eight simple eyes, while ants have two compound eyes; they cover their bodies with reflective hairs to resemble the shiny bodies of ants. In some spider species males and females mimic different ant species, as female spiders are usually much larger than males. Ant-mimicking spiders also modify their behavior to resemble that of the target species of ant, for example many adopt a zig-zag pattern of movement, ant-mimicking jumping spiders avoid jumping, and spiders of the genus Synemosyna walk on the outer edges of leaves in the same way as Pseudomyrmex. Ant-mimicry in many spiders and other arthropods may be for protection from predators that hunt by sight, including birds, lizards and spiders. However several ant-mimicking spiders prey either on ants or on the ants "livestock" such as aphids. When at rest the ant-mimicking crab spider Amyciaea does not closely resemble Oecophylla, but while hunting it imitates the behavior of a dying ant to attract worker ants. After a kill some ant-mimicking spiders hold their victims between themselves and large groups of ants to avoid being attacked. Many of the family Theraphosidae, which includes tarantulas and baboon spiders, have urticating hairs on their abdomens and use their legs to flick them at attackers. These hairs are fine setae (bristles) with fragile bases and a row of barbs on the tip. The barbs cause intense irritation but there is no evidence that they carry any kind of venom. A few defend themselves against wasps by including networks of very robust threads in their webs, giving the spider time to flee while the wasps are struggling with the obstacles. The golden wheeling spider Carparachne aureoflava of the Namibian desert escapes parasitic wasps by flipping onto its side and cartwheeling down sand dunes. A few species of spiders that build webs live together in large colonies and show social behavior, although not as complex as in social insects. Anelosimus eximius (in the family Theridiidae) can form colonies of up to 50,000 individuals. The genus Anelosimus has a strong tendency towards sociality: all known American species are social, and species in Madagascar are at least somewhat social. Members of other species in the same family but several different genera have independently developed social behavior. For example although Theridion nigroannulatum belongs to a genus with no other social species, T. nigroannulatum build colonies thay may contain several thousand individuals that co-operate in prey capture and share food. Other communal spiders include several Philoponella species (family Uloboridae), Agelena consociata (family Agelenidae) and Mallos gregalis (family Dictynidae). Social predatory spiders need to defend their prey against kleptoparasites ("thieves"), and larger colonies are more successful in this. The vegetarian spider Bagheera kiplingi lives in small colonies which help to protect eggs and spiderlings. Even widow spiders (genus Latrodectus), which are notoriously aggressive and cannibalistic, have formed small colonies in captivity, sharing webs and feeding together. There is no consistent relationship between the classification of spiders and the types of web they build: species in the same genera may build very similar or significantly different webs. Not is there much correspondence between spiders' classification and the chemical composition of their silks. Convergent evolution in web construction, in other words use of similar techniques by remotely-related species, is "rampant". Non-orb web designs and the spinning behaviors that produce them have received very little attention from arachnologists, despite the fact that the majority of spiders build non-orb webs. The basic radial-then-spiral sequence visible in orb webs and the "sense of direction" required to build them may have been inherited from the common ancestors of most spider groups. It used to be thought that the sticky orb web was an evolutionary innovation resulting in the diversification of the Orbiculariae. Now, however, it appears that non-orb spiders are a sub-group that evolved from orb-web spiders, and non-orb spiders have over 40% more species and are four times as abundant as orb-web spiders. Their greater success may be due to the fact that sphecid wasps, which are often the dominant predators on spiders, much prefer to attack spiders that have flat webs. About half the potential prey that hit orb webs escape. A web has to perform three functions: intercepting the prey (intersection); absorbing its momentum without breaking (stopping); and trapping the prey by entangling it or sticking to it (retention). No single design is best for all prey. For example: wider spacing of lines will increase the web's area and hence its ability to intercept prey, but reduce its stopping power and retention; closer spacing, larger sticky droplets and thicker lines would improve retention, but would make it easier for potential prey to see and avoid the web,at least during the day. However there are no consistent differences between orb webs built for use during the day and those built for use at night. In fact there is no simple relationship between orb web design features and they prey they capture, as each orb-weaving species takes a wide range of prey. Members of the family Theridiidae weave irregular, tangled, three-dimensional webs, popularly known as cobwebs.There seems to be an evolutionary trend towards a reduction in the amount of sticky silk used, leading to its total absence in some species. The construction of cobwebs is less sterotyped than that of orb-webs, and may take several days. Spider fossils are rare because spiders' bodies are very soft. The oldest known amber that contains fossil arthropods dates from 130 million years ago in the Early Cretaceous period. In addition to preserving spiders' anatomy in very fine detail, pieces of amber show spiders mating, killing prey, producing silk and possibly caring for their young. In a few cases amber has preserved spiders' egg sacs and webs, occasionally with prey attached; the oldest fossil web found so far is 100 million years old. Earlier spider fossils come from a few lagerstatten, places where conditions were exceptionally suited to preserving fairly soft tissues. The oldest known arachnid is the trigonotarbid Palaeotarbus jerami, from about 420 million years ago in the Silurian period, and had a triangular cephalothorax and segmented abdomen, as well as eight legs and a pair of pedipalps. Attercopus fimbriunguis, from 386 million years ago in the Devonian period, bears the earliest known silk-producing spigots, and was therefore hailed as a spider. However these spigots may have been mounted on the underside of the abdomen rather than on spinnerets, which are modified appendages and whose mobility is important in the building of webs. Hence Attercopus and the similar Permian archnid Permarachne may not have been true spiders, and probably used silk for lining nests or producing egg-cases rather than for building webs. The main groups of modern spiders, Mygalomorphae and Araneomorphae, first appear in the Triassic well before 200 million years ago. Some Triassic mygalomorphs appear to be members of the family Hexathelidae, whose modern members include the notorious Sydney funnel-web spider, and their spinnerets appear adapted for building funnel-shaped webs to to catch jumping insects. Araneomorphae account for the great majority of modern spiders, including those that weave the familiar orb-shaped webs. The Jurassic and Cretaceous periods provide a large number of fossil spiders, including representatives of many modern families. It is now agreed that spiders (Araneae) are monophyletic, in other words members of a group that contains a common ancestor plus all and only its descendants. There has been debate about what are their closest evolutionary relatives and how all of these evolved from the ancestral chelicerates, which were marine animals. The cladogram on the right is based on J.W. Shultz' analysis (2007). Other views include proposals that: scorpions are more closely related to the extinct marine scorpion-like eurypterids than to spiders; spiders and Amblypygi are a monopyhletic group. The appearance of several multi-way branchings in the tree on the right shows that there are still uncertainties about relationships between the groups involved. Arachnids lack some features of other checlicerates, including backward-pointing mouths and gnathobases ("jaw bases") at the bases of their legs; both of these features are part of the ancestral arthropod feeding system. Instead they have mouths that point forwards and downwards, and all have some means of breathing air. Spiders (Araneae) are distinguished from other arachnid groups by several characteristics, including spinnerets and, in males, pedipalps that are specially adapted for sperm transfer. Spiders are divided into three sub-orders, Mesothelae, Mygalomorphae and Araneomorphae; the last two are often grouped under the name Opisthothelae. Almost 40,000 living species of spiders (order Araneae) have been identified and are currently grouped into about 110 families and about 3,500 genera by arachnologists. The only living members of the primitive Mesothelae are the family Liphistiidae, found only in Southeast Asia, China, and Japan. Most of the Liphistiidae construct silk-lined burrows with thin trapdoors, although some species of the genus Liphistius build camouflaged silk tubes with a second trapdoor as an emergency exit. Members of the genus Liphistius run silk "tripwires" outwards from their tunnels to help them detect approaching prey, while those of genus Heptathela do not and instead rely on their built-in vibration sensors. Spiders of the genus Heptathela have no venom glands. The Mygalomorphae, which first appeared in the Triassic period, are generally heavily-built and hairy, with large, robust chelicerae and fangs. Well-known examples include tarantulas, trapdoor spiders and the Australasian funnel-web spiders. Most spend the majority of their time in burrows, and some run silk tripwires out from these, but a few build webs to capture prey. However mygalomorphs cannot produce the pirifom silk that the Araneomorphae use as instant adhesive to glue silk to surfaces or to other strands of silk, and this makes web construction more difficult for mygalomorphs. Since mygalomorphs rarely "balloon" by using air currents for transport, their populations often form clumps. In addition to arthropods, mygalomorphs prey on frogs and lizards, and snails. In addition to accounting for over 90% of spider species, the Araneomorphae have the most diverse lifestyles as they include orb-web spiders, the cursorial wolf spiders, and jumping spiders, as well as the only known vegetarian spider. Most spiders will only bite humans in self-defense, and few produce worse effects than a mosquito bite or bee-sting. Most of those with medically serious bites, such as recluse spiders and widow spiders, are shy and bite only when they feel threatened, although this can easily arise by accident. Funnel web spiders' defensive tactics are aggressive, although they rarely inject much venom. On the other hand the Brazilian wandering spider requires very little provocation. There were about 100 reliably reported deaths from spider bites in the 20th century, but about 1,500 from jellyfish stings. Many alleged cases of spider bites may represent incorrect diagnoses, which would make it more difficult to check the effectiveness of treatments for genuine bites. Cooked tarantula spiders are considered a delicacy in Cambodia, and by the Piaroa Indians of southern Venezuela - provided the highly irritant hairs, the spiders' main defense system, are removed first. Spider venoms may be a less polluting alternative to conventional pesticides as they are deadly to insects but the great majority are harmless to vertebrates. Australian funnel web spiders are a promising source as most of the world's insect pests have had no opportunity to develop any immunity to their venom, and funnel web spiders thrive in captivity and are easy to "milk". It may be possible to target specific pests by engineering genes for the production of spider toxins into viruses that infect species such as cotton bollworms. Possible medical uses for spider venoms are being investigated, for the treatment of cardiac arrhythmia, Alzheimer's disease, strokes, and erectile dysfunction. Because spider silk is both light and very strong, attempts are being made to produce it in goats' milk and in the leaves of plants, by means of genetic engineering. Arachnophobia is a specific phobia, an abnormal fear of spiders or anything reminiscent of spiders, such as webs or spider-like shapes. It may be an exaggerated form of an instinctive response that helped early humans to survive, or perhaps a cultural phenomenon that is most common in predominantly European societies. Spiders have been the focus of fears, stories and mythologies of various cultures for centuries. They have symbolized patience due to their hunting technique of setting webs and waiting for prey, as well as mischief and malice for the painful death their venom causes. Web-spinning also caused the association of the spider with creation myths as they seem to have the ability to produce their own worlds. The Moche people of ancient Peru worshipped nature. They placed emphasis on animals and often depicted spiders in their art.